Going to Villa Park anytime during the upcoming 09/10 season, or just want to wear the latest claret and sky blue shirt? Then you're in luck. Check out the new Official Nike Aston Villa 09/10 Home SS Soccer Jersey! 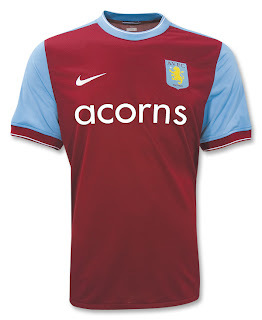 The shirt has a retro style with its crew-neck collar, and once again features the ACORNS sponsor design on the front. It's made of Nike’s advanced Dri-FIT® fabric, which will keep all Villans drier, cooler and lighter by drawing sweat from the body to the fabric’s surface, while its three-dimensional construction gives more air space around the skin to reduce clinging, and keeping you cheering on your team comfortably.